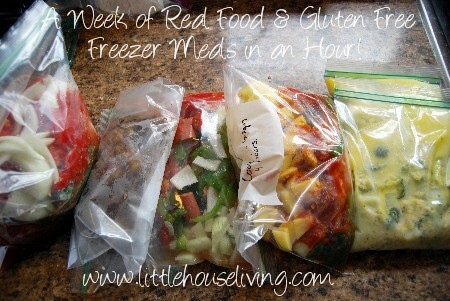 It’s so nice to have grab and go meals in the freezer in case you need them! 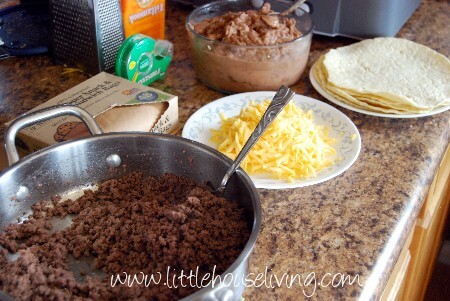 These burritos are super easy to whip up if you have the ingredients on hand and you can always customize to your tastes. It only took me about 10 minutes to put together 12 of these for my hubby to take to work. Grab together your supplies. 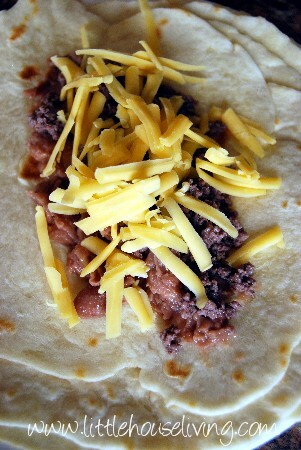 Brown up beef, shred up cheese, have cooked or refried beans on hand, (I cooked dried beans to make easy refried beans) tortillas, and something to wrap the burritos in. I warmed my tortillas up a bit to make them easier to roll. I used my Homemade Tortillas. 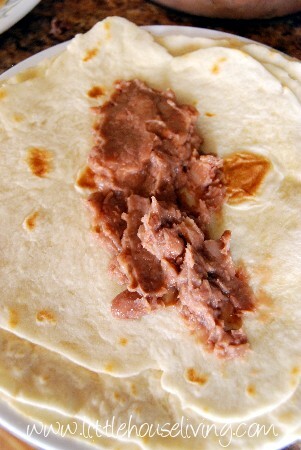 First I put some refried beans on the tortilla. I rolled up the bags and taped them shut. 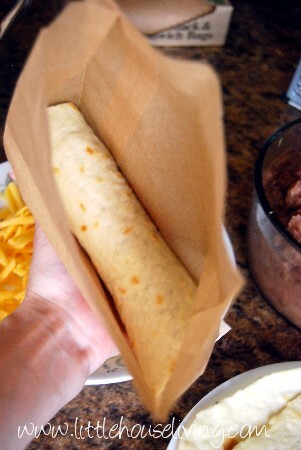 Then I put all the rolled up burritos in a freezer bag and stuck them in the freezer. The reason I chose to put them in the brown bags is for the ease of my hubby to be able to heat them up at work. If you don’t plan on heating them up in the bags you could use aluminum foil. Find even more make ahead meals! Do the bags have to be unbleached or can regular lunch sack bags? I have a surplus of these bags and would love to use them up! 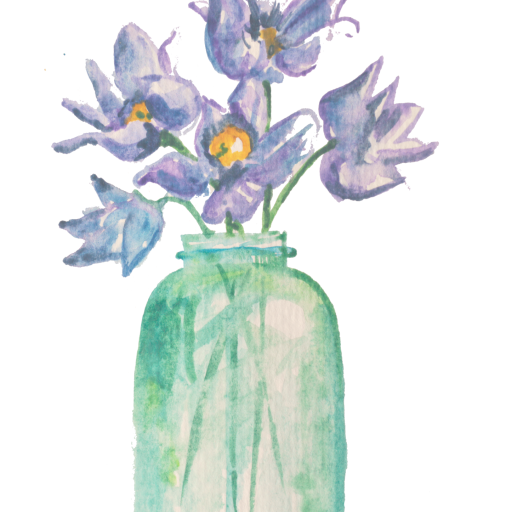 I love to buy a 20-25 pound bag of pinto beans and can them during the cooler months when it isn’t so hot. 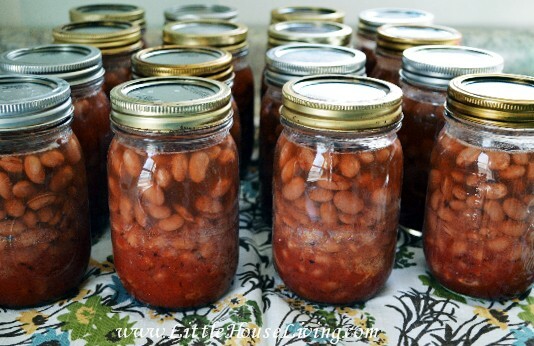 And then when I am ready for “refried” beans, I just open a jar, warm them up and then blend them with my mixer and have instant refried beans. We love them in burritos or on the side with some rice. 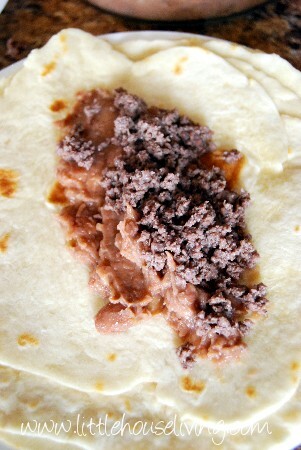 So easy and way cheaper than store bought refried beans. What recipe do you use for your tortillas? I have two. 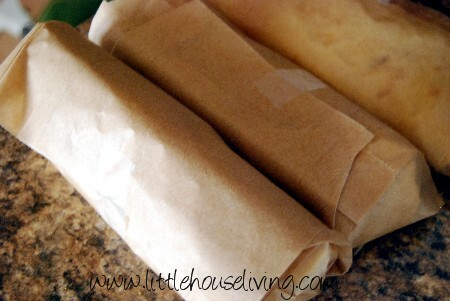 One for Wheat Flour Tortillas: https://www.littlehouseliving.com/wheat-tortillas.html and one for regular homemade torillas: https://www.littlehouseliving.com/homemade-tortillas.html Both are excellent! How long do you heat them up for? My husband only likes hot food for lunch so this would be prefect for him to bring! I’m not sure of an exact time, we just heat them until they are warm! Do you think adding veggies would still be good reheated? Depends on the veggies. Things like sauteed peppers and onions would be really good!